Combine oats, cinnamon, baking powder, and salt in a bowl. Set aside. Mix honey, egg whites, milk, coconut oil, vanilla extract in a separately bowl. Stir the oat mixture into the egg mixture and mix well. Heat a lightly oiled griddle over medium-high heat. 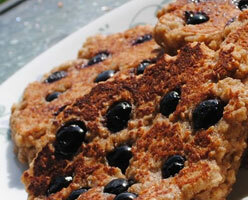 Drop batter by large spoonfuls onto the griddle and top with blueberries. Cook until bubbles form and the edges are dry, 2 to 3 minutes. Flip, and cook until browned on the other side. Repeat with remaining batter.